If the downing of a Russian airliner in Sinai was in fact an act of terrorism, Western media's veritable gloating over the murder of tourists is another mark on their long record of shame. (Article first published in Russian Insider on Sat, Nov 7, 2015. Sometimes we can almost laugh at the twisting of truth in the Western media, as commentators come up with weird analyses to make sense of their own preposterous stories. So it was recently, when their fantastic creation of the 'moderate rebel fighter' was exposed to Vladimir Putin's incisive 'common sense' at Valdai. But such light-hearted moments quickly give way to the more rational sentiments of frustration, vexation and incredulity, and an enduring cynicism about everything that is said and done by those across 'the credibility crevasse' that now separates the West from 'the East'; how can we ever succeed in getting 'common sense' back into the current Western narrative around the Syrian conflict? Following Russia's intervention in Syria there was a wave of optimism on her side of the crevasse that some sense might prevail in the Western corridors of power - a hope that even if Russia's request for cooperation in fighting terrorism was dismissed, those powers and their local agents would at least stop actively fuelling the conflict with arms and propaganda. Some hope. 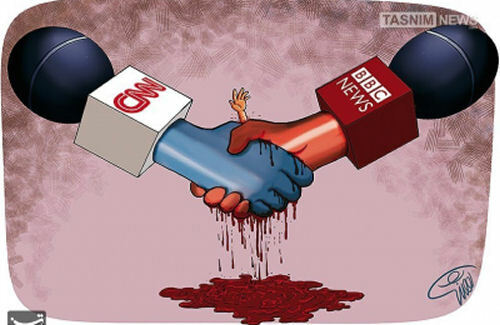 This week frustration with the Western media narrative has turned much darker - the despicable reaction of many media commentators to the tragic deaths of 224 innocent people in the Russian plane crash in Sinai has now turned that frustration to intense anger. Far from this being an occasion to take a step back and ask 'what are we doing that has led to this?' - following on from widespread suspicion that this crash was no accident, those commentators have already framed it as a response to Russia's actions in Syria and Ukraine - even a justified response. For those of us who understand the depths of deceit over the downing of MH17, and the lengthy and compromised Dutch inquiry into the causes of that crash, Kelly's casual dismissal of Vladimir Putin's conduct is highly offensive. Although we all know that Russia's investigation into the Ukrainian crash was stymied by the refusal of the US to release its satellite data, and Kiev's refusal to release air transport control records for the flight, Kelly and other commentators ignore this. They continue to claim that Russia vetoed moves at the UN to set up a criminal investigation because this would reveal Russia's guilt over the atrocity. Because of them, Australians now believe that Vladimir Putin has 'denied justice to the victims of MH17'. It is disturbing to realise that the thinking of Western commentators, and of the public who believe them, have been so poisoned by Imperial propaganda that they feel free to express the most despicable of sentiments about officially approved enemies, and are able to do so without condemnation. Such is the implicit suggestion that somehow the downing of the Russian plane over Sinai, and killing of 224 Russian citizens is atonement for 'Russia's shooting down of MH17'. Such views may only have been expressed openly on Twitter - as reportedly happened in Holland - and in the Newscorp press, but they seep from every news outlet, social gathering and Parliamentary session, reflecting Australia's growing Russophobia and public demonisation of Vladimir Putin. As seems to happen frequently nowadays, new developments around this subject demand inclusion. And anger turned to disgust, as news reports today that a terrorist bomb may have been responsible for the downing of the Russian plane completely excluded any reference to Russian opinion or intelligence on the matter. Firstly the Egyptian economy is heavily dependent on tourism, so anything that eroded internation comfidence in Egypt as a tourism destination is going to have significant implications. Something was horribly missing from this news - any mention of how the relatives and friends of the victims of the Russian plane crash might be feeling now, knowing that their loved ones had been unwilling martyrs in the fight to save Syria from Western-backed terrorism.